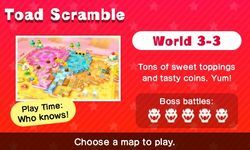 World 3 is the fourth set of boards in the Toad Scramble mode of Mario Party: Star Rush. They are unlocked by completing a game on World 2. 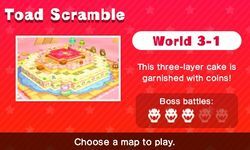 World 3 features a birthday cake theme. Some boards have a feature where a large amount of coins are dropped onto the middle of the cake halfway through the game. 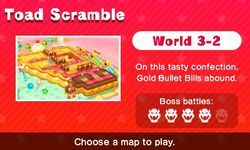 Some feature three Gold Bullet Bill launchers, and every turn a roulette is spun to determine which, or all, are fired. Characters are chased to the edge of the map and coins are left in the path of the bullet bills.